Love will be twelve rounds of the most gruelling fight of your life. It must be constantly struggled for; it is an endless and beautiful war. I don’t know exactly what love is, but I know a few things it isn’t. Love is not elusive. It is not an exotic animal endangered by the rampant poaching of unrealistic romantic comedies. It is not a crop that is at a risk of complete exhaustion due to the swelling number of beating hearts starving for it. Love is as abundant as it was when white knights draped in their chivalry were in the height of fashion. It is as ever-present in us as it was in the immortalized lovers Romeo and Casanova. That universal force we call love has never changed, but our romanticism of it has. We’ve somehow turned love into a treasure of lore that can only be obtained through toil and trouble. It has become a sort of Holy Grail, only reachable by the brave crusaders of cupid. An alchemist of love requires the perfect concoction of timing, skill, and luck to brew the elusive and everlasting elixir of Eros. In between stone masonry and tax evasion, we’ve left love to collect dust on the shelf of dying arts. Why have we done this? Because it was easy to. It’s easy to want to fall in love. It’s easy to be in love with the idea of love. It’s easy to imagine laying on a bed of roses and feeling completely vulnerable in the safety of that special someone’s arms wrapped tightly around you. It’s easy to hope for your own Ryan Gosling or Rachel McAdams as you watch the Notebook with a tub of Ben and Jerry’s. It’s easy to paint, with the most passionate of oils, that perfect portrait of the young unrelenting love that we want to find. It’s also easy to make excuses. It’s easy to build makeshift walls. They are quickly and easily erected. Timing, distance, near or remote plans for the future, work, school, gym, yoga, grocery shopping, career progression, meal preps, pets, television series box sets, weekly (or daily) fro-yo, the past, the weather, the opinions of friends and family, or that new book that Oprah recommended, are some of the many excuses – big and small – that we use to protect us from opening ourselves up to the love that constantly surrounds both you and I.
I know very little about this crazy world we’re caught spinning in. When it comes to love I know even less, but I do know three things for certain. The first is that there is no such thing as a perfect human being. You’re not perfect, God knows I’m not perfect, and that sweet boy or cute girl you’ve had your eye on at work certainly isn’t perfect either. 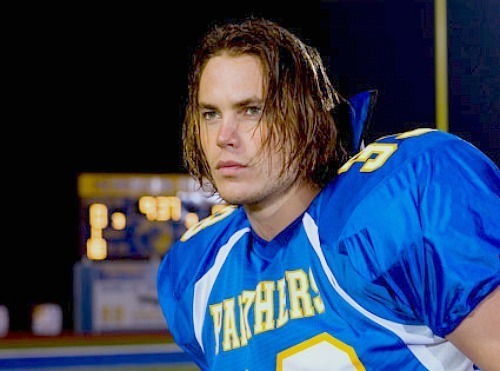 Taylor Kitsch is probably the closest I’ve seen to perfection and I’m sure even he has a single flaw, somewhere. I won’t be as cliché as to suggest that love is instead when two imperfect people are perfect for each other, because I don’t believe that either. What I do believe is that love will be twelve rounds of the most grueling fight of your life. It must be constantly struggled for; it is an endless and beautiful war. The very idea of perfection should be erased completely from our conception of love. Love exists not between two imperfect people perfect for each other, but two lovers perfectly and sincerely at peace with one another’s imperfections, so much so that they’ve even come to regard those flaws with admiration. The second thing I know is that none of us have been without pain in our lives. Whether it was a family member, close friend, significant other, or that dickhead on your school bus, we have all been hurt by someone we have let into our lives. That isn’t to say our hands are not bloodless, either. Conscious of it or not, we’ve done our share of the hurting as well. Every single cut we’ve suffered has left a scar and, no matter how small or insignificant it may appear on the surface, every one of them causes us to flinch a little more at the prospect of love’s left hook. We put our gloves up and we duck for cover. We step out of the ring because we remember the pain of those scars from our first few rounds. Scars that still feel fresh in our minds. Scars we’re afraid to look at. We should, like the prized pugilists that we are, wear those scars as the badges of honour they are. We should be proud of every moment we’ve spent in the ring – regardless if it was a win or a loss. Whether it was a grade three knock-out from a fling that only lasted for first recess or a unanimous decision that ended a five year romance, we need to keep our chin up. We’ve loved and lost, and that’s something we need to take pride in. It’s better than never have taken a swing. So we can all keep comparing our scars, or we can actively work on de-constructing that flawed personal belief that we’ve somehow suffered more acutely than the person who’s chasing us. Either way, let’s get back into the ring. The course of true love never did run smooth.” William Shakespeare, A Midsummer Night’s Dream. The third and final certainty I possess is that love will not come to you. It will not jump your fortified walls or smash through the obstacles you’ve put in front of it. Sure, there’s always the chance that you’ll be caught out in a vulnerable moment outside of those walls, and fall deeply in love with someone. There’s a far greater chance, however, that your many years of perfecting your defences will produce barriers too well constructed to be breached. Eventually, you’ll have effectively exhausted all of your excuses, and wake up at fifty years old as a successful, strong, and incredibly lonely person. It’s extremely hypocritical to expect people to open themselves up to our love when we’re not willing to do the same. I’m not saying to settle. I’m not saying to look for love just for the sake of loving. I’m just saying we should try to open ourselves up to love. Chase that butterfly feeling when you get it rather than trying to snuff it out. I think we’d all be surprised with the results if we, for once, stopped being our own largest hindrance of real love in our lives. There will be no perfect time, and you will never truly be ready. You and I were born to love. You just need to let love in.